The Royal Navy's Grand Fleet dominance at Jutland in World War I centered around big-gun battleships designed to overpower Germany's High Seas Fleet. In 1906, the Germans began building a dreadnought fleet of their own, and while they used a smaller main gun than the British, word soon reached the British Admiralty that German designers were planning to build a new class of dreadnoughts, armed with larger guns. This raised the specter that the British dreadnought fleet would be outgunned, and prompted the Admiralty to order the building of their own "super dreadnoughts". The first of these new dreadnoughts were laid down in 1909, and entered service three years later. The British public supported this program, and the slogan "we want eight and cannot wait" became popular, a reference to the building of eight of these super dreadnoughts. These first eight were augmented by the Erin and the Canada, both of which were being built for foreign navies until commandeered by the Admiralty. Four more super dreadnoughts entered service in 1914. By then the Admiralty had developed a new program of "fast battleships", armed with 15-inch guns. These powerful warships entered service in time to play a part in the battle of Jutland in 1916. World War I broke out before the Royal Navy had fully evaluated these new warships, and so lessons had to be learned through experience - often the hard way. Although none of these super dreadnoughts were lost in battle, their performance at the battle of Jutland led to a re-evaluation of the way they were operated. Still, for four years they denied control of the sea to the enemy, and so played a major part in the final collapse of Imperial Germany. 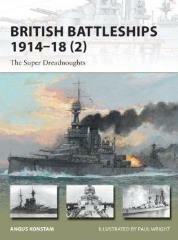 This New Vanguard title, the second of two covering the British battleships of World War I will continue the story begun in the first volume by taking a detailed look at the later battleships in the fleet - the "super dreadnoughts".